MAC in a Year – July/August | Love it. Like it. Lose it. For the month of July/August I have been trying out some products from MAC’s Sized to Go Collection as I was going to be doing quite a bit of travelling, especially towards the end July so I thought it would be relatively easy to take along with me. I picked up MAC’s Cleanse Off Oil (£7.00 for 30ml) and Fix+ (£7.00 for 30ml). I’d heard quite a lot of good things about these products and so thought that I would give them a try. The Cleanse Off Oil because I liked the idea that the oil would really get rid off any makeup traces my wipes had missed and the Fix+ because anything to make my makeup last longer sounds like a great product, plus I’d heard it was a great ‘pick-me-up’ product. 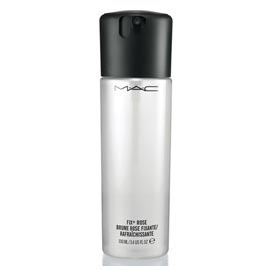 First off let’s look at MAC’ Cleanse Off Oil. It’s basically an oil cleanser that should help to remove makeup more efficiently than a wipe; it claims to loosen all makeup, including waterproof mascara. You basically slap it on your face, massage it a bit and then rinse it off with some warm water. Doesn’t remove all makeup in one go; it would probably take a couple times of putting the oil on the face and then rinsing it, therefore you’d probably use quite a bit of product. For £18.50 for 150ml I feel that it’s quite a lot for a product that doesn’t work effectively on me. The design; because the lid is a push down function, with only a twist of the lid to close it, this product isn’t very travel friendly (slightly ironic seeing as it’s part of the Sized to Go Collection), the twisty lid moves very easily and so it can leak quite a bit. I don’t know if there’s a similar problem with the full size as it appears to come in a pump? Verdict = Lose it. This just didn’t do anything for me, so I wouldn’t really reach for it as it just feels like an extra un-necessary step in my cleansing routine. Next up is MAC’s Fix+. This product is basically a face spray; you spritz it on and your skin feels moisturised and once it’s sunken in looks slightly dewy/radiant. Some say that this product helps to increase the lifetime of your makeup, and I guess in some ways it does but I think this is only because of how it works to moisturise the skin, so it doesn’t allow your makeup to become flakey or patchy. Feels soooo good on the skin, especially in warm and humid weather. Gives the skin a lovely natural, luminous look to it. Skin feels hydrated; potentially could be great for those with dry complexions. My makeup did stay looking fresh for slightly longer. Kinda makes me break out if used too often. Wouldn’t be good for those with really oily skin; if you put too much on it backfires and makes your makeup slide off. Whilst my makeup stayed on a touch longer than normal, I wouldn’t suggest using this for that exact purpose. Verdict = Like it. Fix+ is an ok product, I do enjoy using it and the finish that it gives to my skin, however only in small quantities due to my skin not particularly liking it, but that’s just my skin – it may work really well for yours (especially those with skin on the dry side). I lov your blog concept. When are u going to do another post on some other Mac products?